The closest thing I can come to describing these djinn is they are like potent concatenations of the most important aspects of their specific tarot card (as related to the Hebrew letter they correspond to). 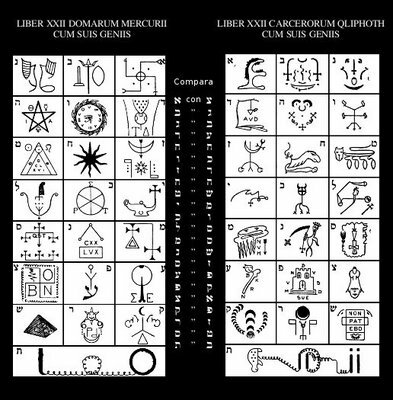 The book is divided into Mercurii, Light Djinn, and Qliphotic, Night Djinn… the original instructions of the book is to compare sigils…but I don’t think it just means a boring one to one comparison. One thing for certain is that the dark side represents “negative” aspects of their respective path, while the Mercury side, is the holy aspect of these paths. There is great power in using them in potent spells by harnessing the polarization of the light side and dark side djinn. In my experience, the pairing between the light djinn and the dark djinn works well. That is obvious. but what is not obvious is that taking an eclectic approach to balancing them out works best and yields powerful and exception results. Meaning that the djinn for the letter, Aleph, for example, does NOT need to necessarily be paired with the dark (Qliphhotic) Aleph–that merely leads to dull results. Rather, any number of light side pairs can be balanced with any number of dark side pairs, for interesting, powerful and noticeable results which can be felt and seen astrally during casting. I started using them more heavily for clients in the last year and they have had powerful results on cases where even Goetia and other traditional methods had failed.